Enjoy an extraordinary cruise holiday in Europe, starting in 2020. The newest Princess ship provides endless opportunities for celebration, entertainment and rejuvenation. Enchanted Princess will cruise you away in exquisite style and spectacular luxury, making your holiday into a once in a lifetime experience. 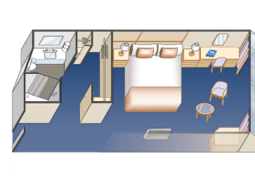 All of the ship's impressive cabins, no matter which category you go for, are the perfect place to recharge your batteries. 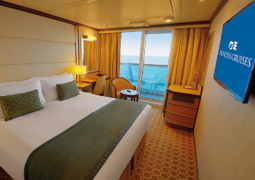 You will feel at home in the spacious, beautifully designed staterooms, be it an affordable Inside Cabin, an airy Balcony or a luxurious Suite. If you are after something exclusive, do check out the Enchanted Princess' Sky Suite. Located right at the very top of the ship, this 145m² cabin will blow your mind. The interior with two bedrooms and two bathrooms is impeccably appointed. This cabin is much more than just home away from home. The dining options on board the Enchanted Princess are unparalleled. There is something to satisfy any taste - from buffets, to authentic gourmet pizza and refined specialty restaurants. 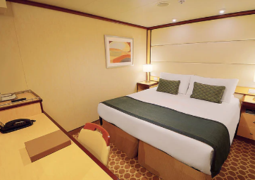 Like all Princess ships, the Enchanted Princess offers a variety of different Inside, Outside and Balcony Cabins as well as Mini-Suites and Suites. 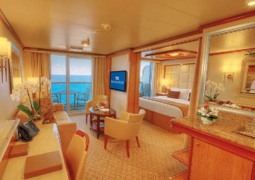 The real jewel in this Princess' crown is the Sky Suite offering the ultimate in luxury cruise accommodation. Hosting up to five guests, this Suite boasts the largest balcony at sea with amazing 270-degree panoramas and a full view of the 'Movies Under the Stars' screen. 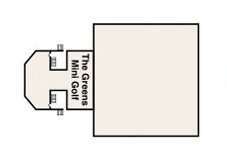 There is a very extensive range of dining options on board the Enchanted Princess. The main Dining Room offers original creations, prepared fresh every day by a top chef. Feel free to make a reservation on the dining hotline but Anytime Dining ensures that you can dine flexibly and comfortably. All palates will be accommodated on board the Enchanted Princess: the 'Ocean Terrace' offers the freshest seafood, the 'Salty Dog Grill' - handmade burgers and other pub classics and the 'Alfredo's' pizzeria tempts with authentic hand tossed pizza. Afternoon tea is served daily with decadent cakes, biscuits and sandwiches. There is a whole host of daytime entertainment for all ages on board the Enchanted Princess. There is a state-of-the-art pool and sports facilities, fascinating 'Discovery at SEA' programmes, a Theatre, a Princess Live and a Casino - so you'll never be bored during the day or in the evenings. If, however, you'd rather relax and enjoy your evening with your favourite wine or a cocktail, make sure to visit 'Bellini's' or 'Crooners Bar'. Generally, you are advised to wear practical clothes that are appropriate for the climate you are in during the day. More formal clothes may be appropriate in the evenings, however, it isn't a must. Elegant clothing is required for some special occasions, though. Please note that swimwear, shorts, etc. are not permitted at the a la Carte restaurants.